BWC is a unique roadside service that helps the environment by donating 1% of revenue to environmental cleanup and advocacy groups ($35,000 to date). They support consumer rights, alternative transportation and do not use our membership fees to lobby against the Clean Air Act. Every year I embark on a new adventure when attending the Natural Products Expo in Anaheim CA. My mission – to have a good time, connect with old friends, meet new ones, and find Kathy's Favorite Products that truly are healthy and sustainable. For me (and hundreds of others) the weekend always starts off with the Organic Farmers Research Foundation's (OFRF) meet and greet luncheon on Thursday. The OFRF is a non-profit organization that sponsors organic farming research and education projects, disseminates the results, and educates the public and policymakers about organic farming issues. Kathy Arnos is the editor, producer and host of Eco Family News (EFN), a free e-newsletter, blog and radio show based on the principals of Whole Children, Whole Planet (WCWP) - the first natural parenting and family expo - an event about raising healthy children in a safe, natural, non-toxic, nurturing environment. Our goal at EFN is to introduce and offer families, friends, and professionals a comprehensive resource and overview of products, companies, organizations, sustainable practices and enrichment learning programs that support healthy sustainable lifestyles for both children, and adults – mind, body and spirit. http://www.wholeplanetproductions.com. 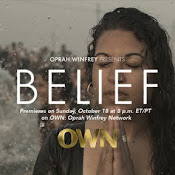 Oprah Winfrey presents ‘BELIEF’, a seven-day series airing on October 18th on OWN TV. These thought provoking episodes will inspire tears of joy, laughter, and an intimate education about many different cultures, rituals, and the grace of the human spirit ... We at EFN love this series. Trace Amounts offers explosive commentary from a current CDC senior scientist who shares his thoughts on the CDC’s awareness of the link between thimerosal and the neurological damage it causes. Join Hay House as they present some of the most inspirational authors and visionaries of our time - Louise Hay, Dr. Wayne Dryer, Cheryl Richardson and many others ... attend a conference. This handy booklet describes each of the 38 flower essences, their healing properties in relation to a specific emotion and/or physical behavior, and a repertory quick reference guide. An education on raising healthy children using natural remedies for teething-related symptoms: fevers, diarrhea, nightmares, ADD/ADHD, sleeplessness, depression, headaches, earaches, anxiety, croup, sinus and more. Get Eco Family News Blog updates on the Facebook Fan Page.